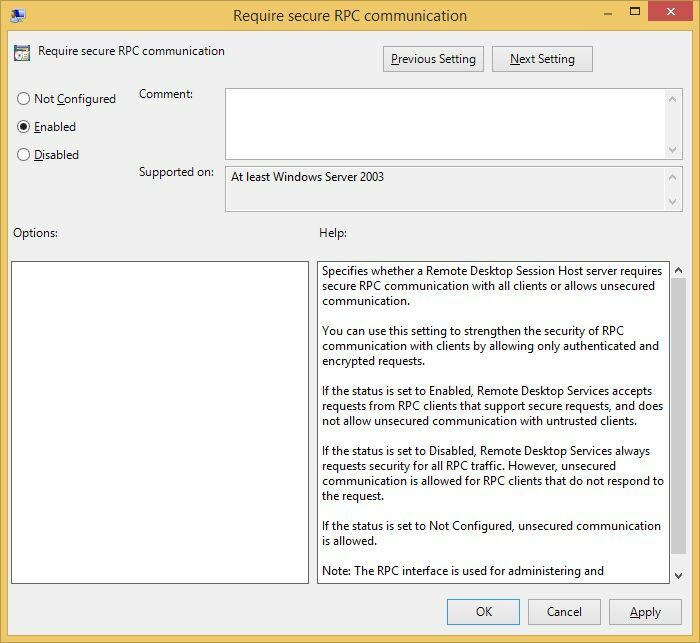 Usually setting up a basic RDP connection is sufficient enough for most intents and purposes but let's say that we require additional security. Then please allow me to demonstrate how to become proficient at elevating security when allowing Remote Desktop Access. First things first - we do need to enable RDP so run sysdm.cpl and click on the Remote tab. 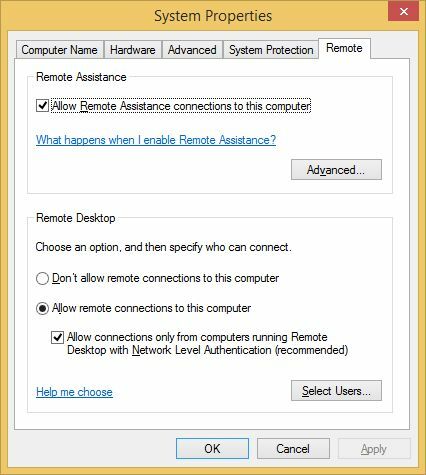 Then click on the “Allow remote connections to this computer” radio button and check the “Allow connections only from computers running Remote Desktop with Network Level Authentication.” checkbox. Now select the users that will have access to your computer by clicking Add… When you're done lets go to step 2. NOTE: By checking the latter you effectively and actively engage suppression of potential Man in the Middle attacks so let's count this one as a first step towards enhanced protection. Also, you might get a warning about Power Options when you enable Remote Desktop so please follow the link provided in the dialog box and configure the Power Plan of your computer as advised by the warning. When we're done handpicking all the folks we want to have access, let's eliminate all of the 'unwanted elements'. 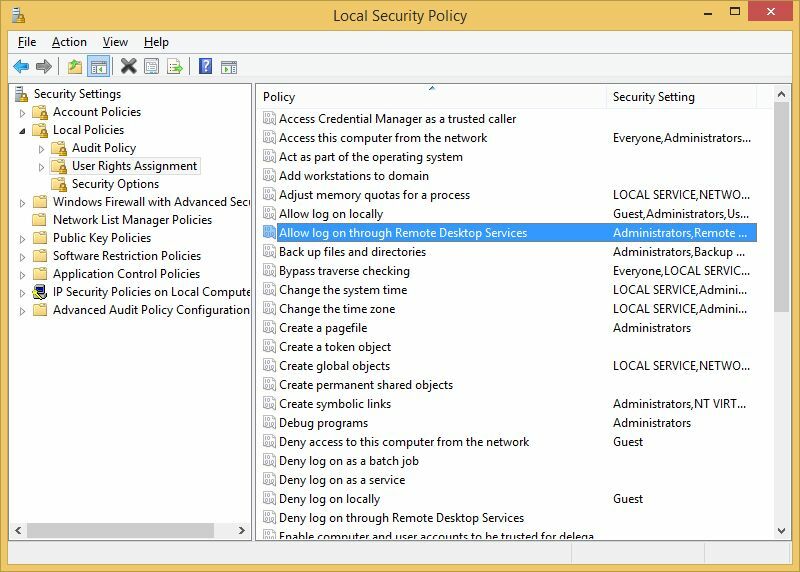 First of - we'll have to eliminate default user groups through Local Security Policy so lets run secpol.msc and configure the following: Security Settings → Local Policies → User Rights Assignment and double click on “Allow log on through Remote Desktop Services” policy from the list to the right. 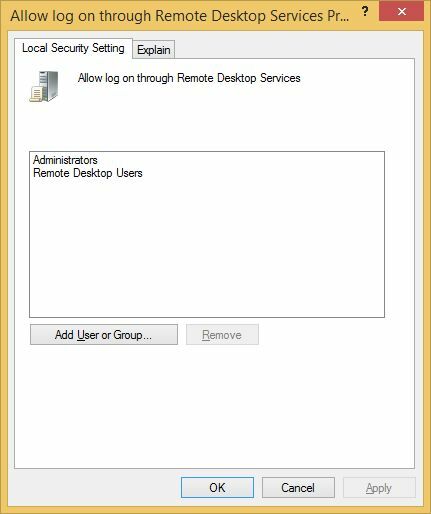 Now remove both default groups - Administrators and Remote Desktop Users and manually Add User or Group for which you'd like to be able to connect. NOTE: We eliminate groups because we expect that since we have elevated security for this or that reason, all our users will also use complex passwords, so if we remove the Administrators group completely and latter on create a new admin account with a weak password, we are still preventing attacks since the new account will not have access until we manually add the new account the way we've done it in this step. 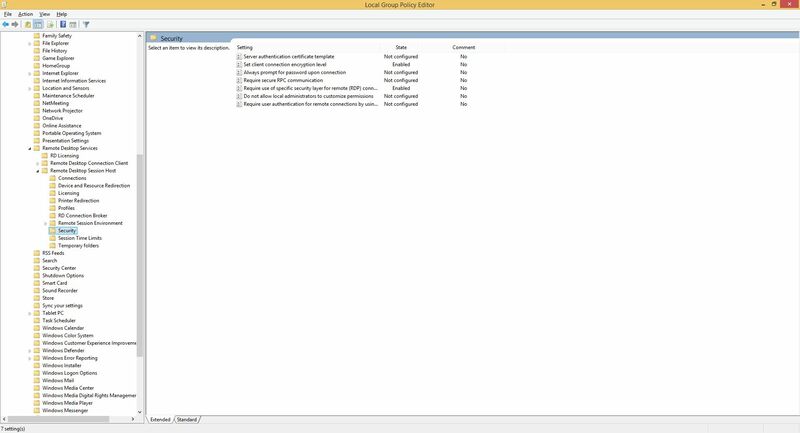 So far we've poked around user rights and the likes but now let's really get donw'n'dirty by securing the connection itself with several Local Group Policy mods. That said run the gpedit.msc and go to Local Computer Policy → Computer Configuration → Administrative Templates → Windows Components → Remote Desktop Services → Remote Desktop Session Host → Security. 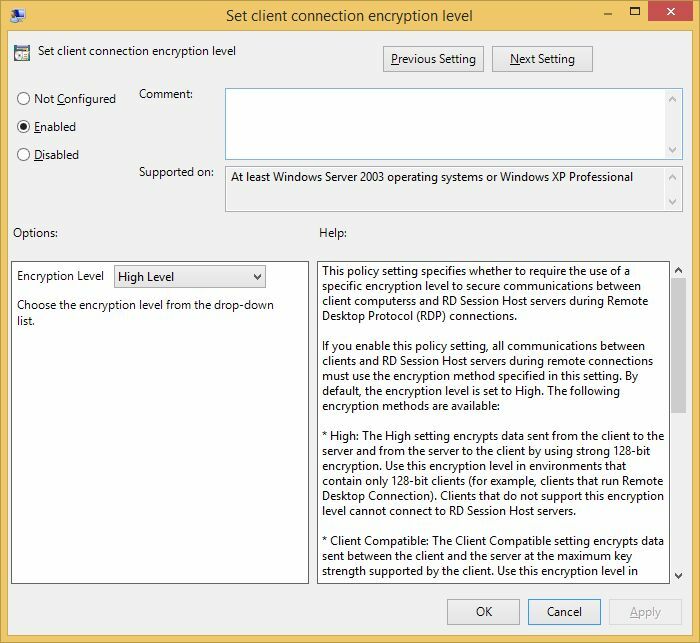 NOTE: FIPS Compliant option is disabled by default in System Cryptography and just to let you know that the practice of using FIPS became a no-no if latest Microsoft views on security are to be taken into account so we'll leave enabling and using it for a different topic altogether. 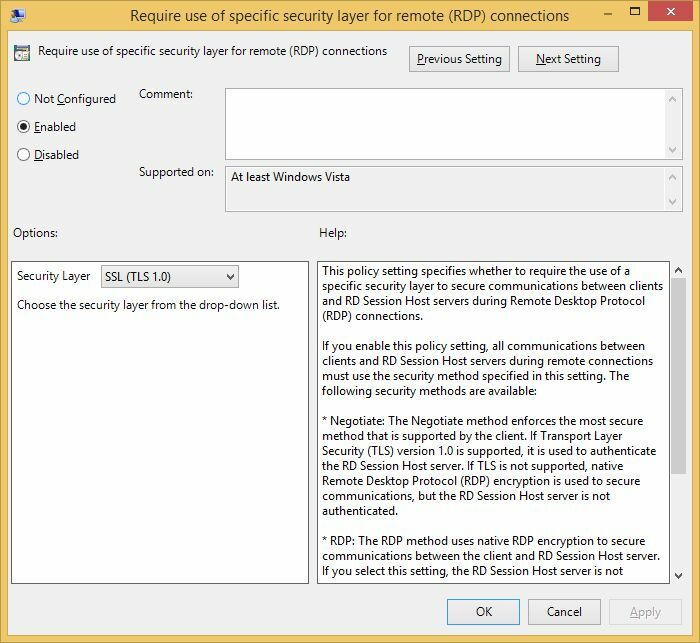 …and by doing so we can now use TLS encryption by setting the “Require use of specific security layer for remote (RDP) connections” policy to Enabled and selecting SSL (TLS 1.0) from the “Security Layer” drop-down list. 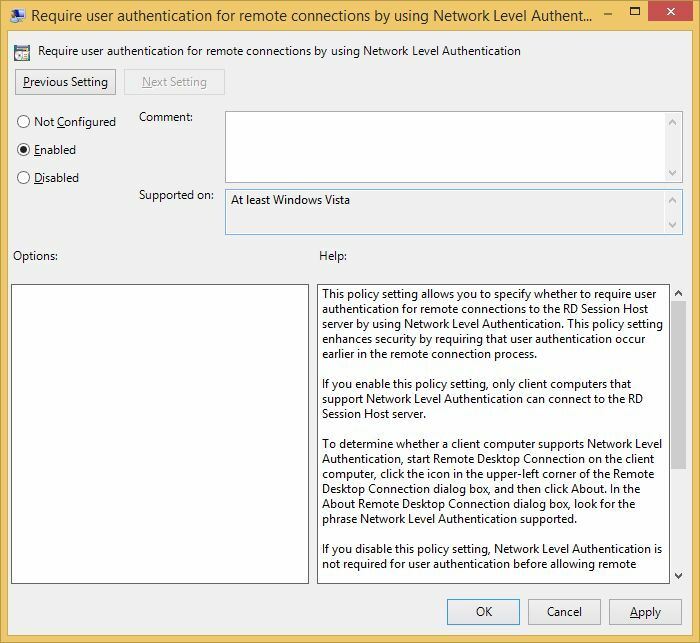 And finally: Enable the “Require user authentication for remote connections by using Network Level Authentication” policy. All setup in the Policy department and now we can move on to the final step. 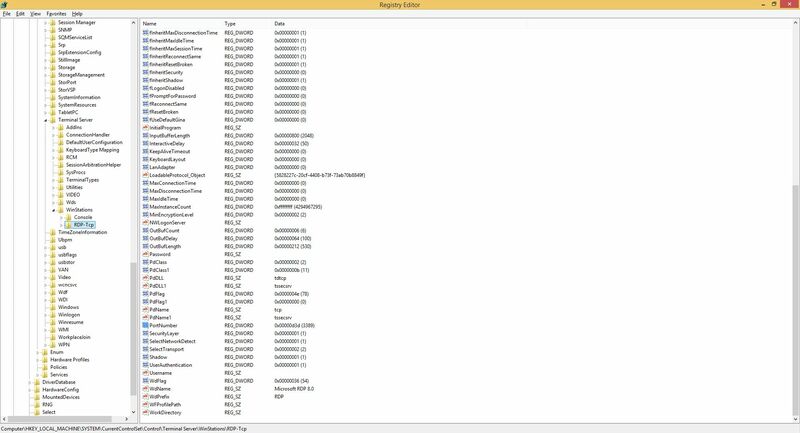 All of the Windows using world by now knows what a port is, what it's used for and can probably name at least ten basic ports and explain their uses. That said, and given we already went through all this trouble to setup a most secure RDP connection it would so not be a good idea to leave the default 3389 port 'alive' and listening for connection requests so let's obfuscate a little bit. Open up your Registry by running regedit.exe and find the following HKEY_LOCAL_MACHINE → SYSTEM → CurrentControlSet → Control → Terminal Server → WinStations → RDP-Tcp. Now double click the PortNumber DWORD and change it's Decimal value to a five-digit number lower then 65535. I'll pick 38389. We're done and by now I reckon you didn't figure it's gonna be that much work just to secure a lil' ole Remote Connection did ya!? Yikes!